TV antennas in the early days of broadcast television were typically fairly simple designs that worked well for city dwellers and anyone living within a few tens of miles of the tower, but rural dwellers struggled for a good signal. Even urban and suburban TV owners had problems with multipath reception that created ghost images on the display. The farm folks needed the high gain of a more complex antenna for pulling small signals out of the noise, while urbanites needed high directivity to be able to reject signals that were bouncing off buildings and bridges before combining in the receiver to produce multiple versions of the picture. Unlike today where relatively small, compact antennas with a low noise preamplifier at the antenna (see my Able Signal antenna write-up) does a pretty nice job of guaranteeing a good signal, large structures with many large elements were needed. Recall photos of building rooftops in a large city that were chock full of TV antennas. 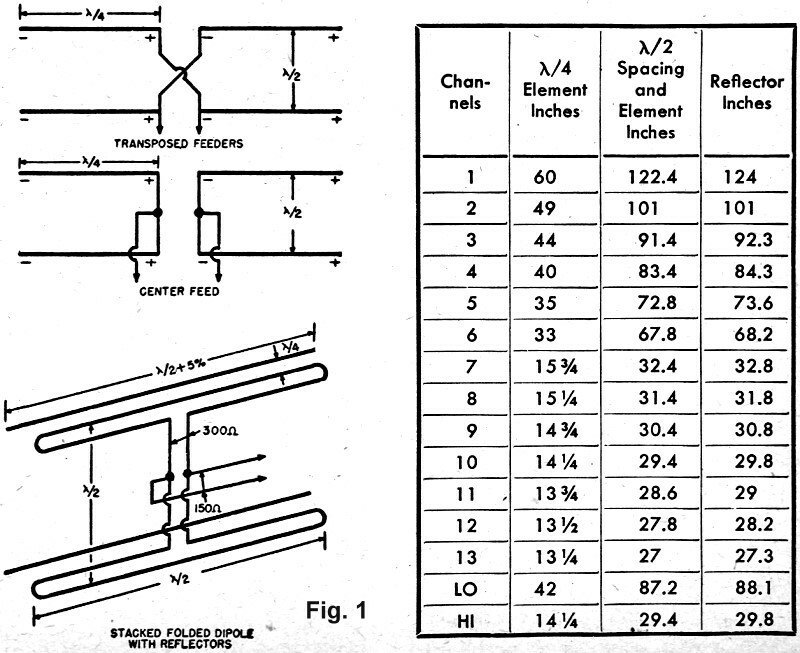 This article describes a means of stacking multiple identical antennas vertically for achieving additional gain with careful phasing of the transmission lines between them. Horizontal antenna elements stacked vertically concentrate sensitivity at low vertical angles to correspond with the low angle of arrival of the television signals. At high frequency all high angle radiation is useless because it penetrates the ionosphere. Radiation at low vertical angles with respect to the horizon contributes the useful line-of-sight signal and extended line-of-sight signal. If the receiving antenna is designed with peak sensitivity at low angles we not only benefit from stronger signals but have a much improved signal-to-noise ratio because the antenna cancels noises arriving from above or beneath. Stacked antennas are usually connected in phase, Fig. 1, to produce an additive signal at the transmission line. Noise components arriving above or beneath strike one element first and then, a half-wave later, a second, resulting in cancellation. The desired signal strikes broadside exciting both elements in-phase and by proper transmission line connection becomes additive. Two methods are shown. In the first drawing, feeders are transposed between elements putting both signals in-phase at the point the transmission line is attached. This system depends on half-wave spacing to give polarity shift. A second method is to feed at the center-point which will keep the transmission line point of connection the same distance from each element. This latter method is not as frequency-critical as the former. Parasitic elements and various types of driven elements can be used. Fig. 1 shows stacked folded dipoles with reflectors. 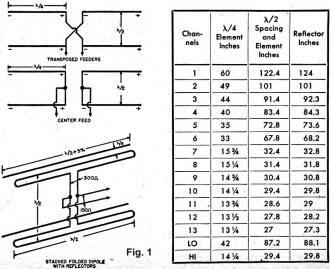 Whenever two in-phase elements are paralleled antenna resistance is halved. For the stacked antenna shown 300-ohm line would run between elements and it would be opened at the center for attachment of the 150-ohm line for ideal match. Again it is important to stress that if the receiver has only a 300-ohm input match the receiver and let any mismatch which must occur be at the antenna.